There are 34 prints at the annual exhibit this year. The prints are always unveiled the third Saturday of October. To make the buying process fair, people have to enter their names in a draw. Drawing is Cee Pootoogook's full time job. "I always draw," he says. "I do drawing about maybe three to four hours a day." 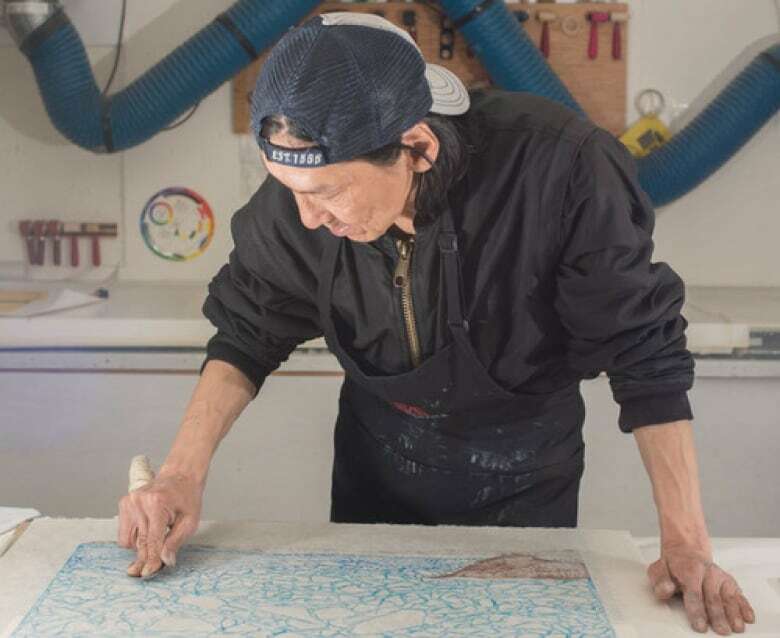 Pootoogook is a printmaker at the Kinngait Studios, in Cape Dorset, Nunavut. He has two pieces in this year's collection of prints from the studio, which will be on display when the exhibit opens on Saturday. It's one of the longest continuously running printing studios in Canada; it's been releasing annual collections for 59 years, since 1959. There are 34 prints in total this year, from 11 artists. "What comes out of Kinngait Studios is incredible quality," says Gyu Oh. 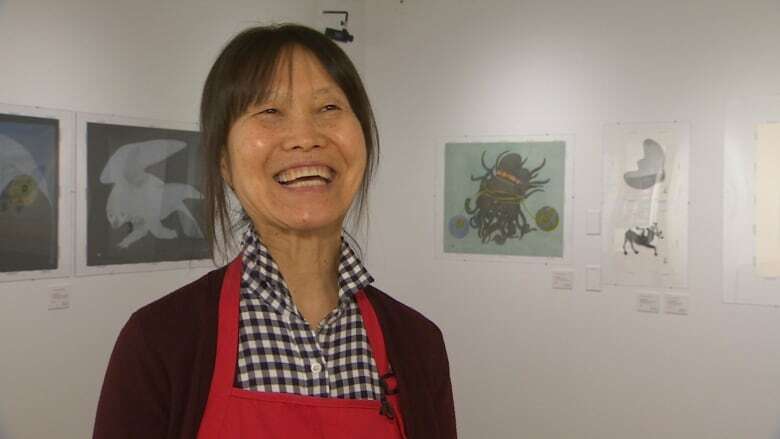 She's been the curator at the Nunatta Sunakkutaangit Museum in Iqaluit for the past four years. Every year Oh is excited to curate the Dorset collections. The prints are always unveiled the third Saturday of October, Oh says, but she starts getting calls about the prints in August. "'When is it coming?'" she says people ask her. "'Is the calendar out?'" There are 50 copies of each print, and they're not photocopies. "Every single one is inked and printed, all hand printed separately," says Oh. "It's a long process and very labour intensive work, making prints." The labour that Pootoogook puts into his drawing is apparent in the work that comes out of his community. It takes a year for artists to produce enough for a collection — the quality is always top notch, and the images are always interesting, Oh says. The copies of each print are distributed to galleries across North America. In Cape Dorset and Iqaluit there are two copies of each. The prints range from $450 to $1,200. Oh says the day the collection is revealed, and prints go on sale, people are shoulder to shoulder in the gallery in Iqaluit. Dorset prints are consistent in design and excellency, says Oh. That's one of the things that makes them so popular among art collectors. To make the buying process fair, people have to enter their names in a draw. The first name called gets to choose the print they want to buy, and then the draw continues. This year Kinngait Studios moved out of the building it shared with the West Baffin Eskimo Co-op, and moved into a new space called the Kenojuak Cultural Centre. This is the first collection of prints to come out of the new studio. "We really love it here," Pootoogook says. "I like what I'm doing here, I like drawing and printmaking." However, along with the new studio space, there are other things that are slowly changing. Pootoogook says the presses used to be made out of soapstone, now they're slate. He says slate is better because it's softer than soapstone. He also says the drawings are changing. 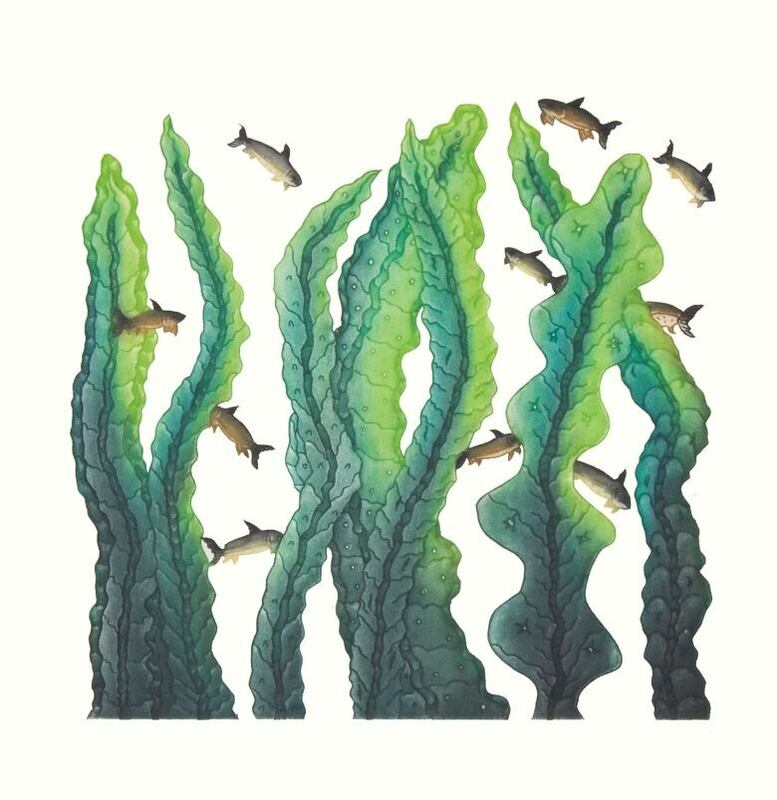 They usually depict fish and animals, but now artists are expanding. 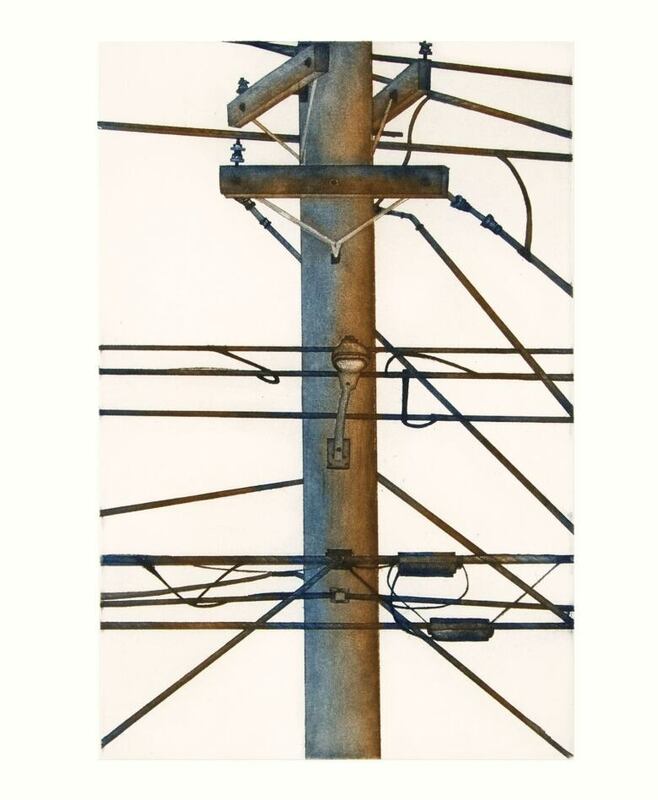 This year, for example, one print by Padloo Samayualie is of a telephone pole and wires. So realistic, at first glance it could be mistaken for a photograph, which is unlike the mystical, colourful style of most of the prints. 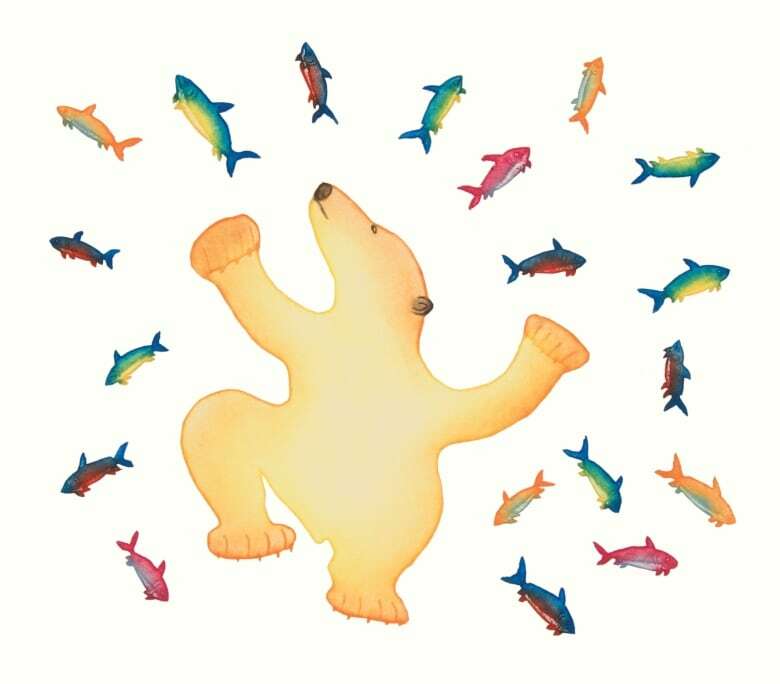 Pootoogook's own prints are of a swimming polar bear surrounded by fish — another is a fish swimming amongst seaweed. They're the images he always sees in his head when he's hunting, he says, but he's not doing much hunting these days; he's too busy drawing.